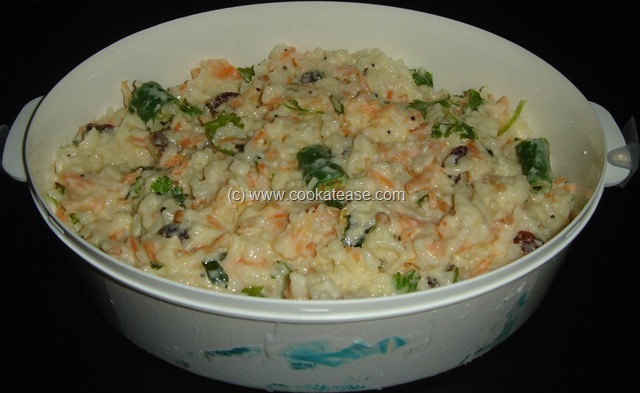 Curd rice or yogurt rice is a simple Indian dish, especially consumed more in southern states. This curd rice is served in the end of all feasts, which gives a smoothing effect after having hot spicy items. This is also a dish prepared on day today basis especially for lunch boxes. Curd rice is having a special place in children menu due to its creamy texture. This curd rice is prepared in slight variation from home to home. Here I share two types of curd rice that I prepare for special occasions like party or get together. As fruits and vegetables are added, this is tasty and healthy. Because of their colour and taste, children love it. Rice Preparation: Wash and boil rice with given milk and water; cook extra 5 minutes more than the usual time in low flame. Cool well, add salt, curd and mash nicely (if needed add some water); add pomegranate, mix and serve chilled. Gives a wonderful taste of biting sweet pomegranate arils in between while eating; children will love them definitely. Carrot is a good source of vitamin A and good for growing children. 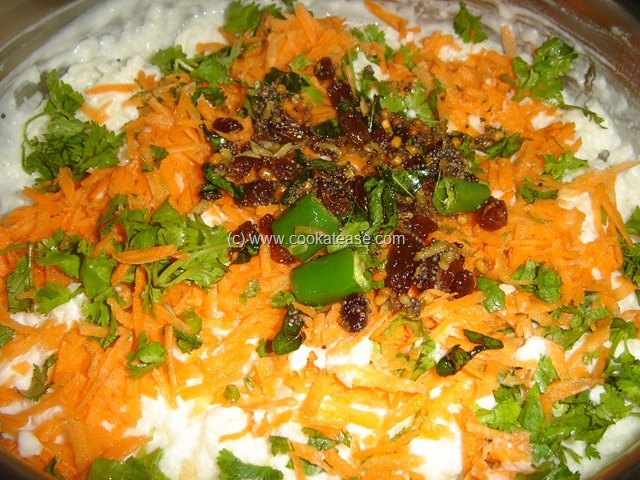 Raw carrots are added in this to improve the nutritive value of curd rice. 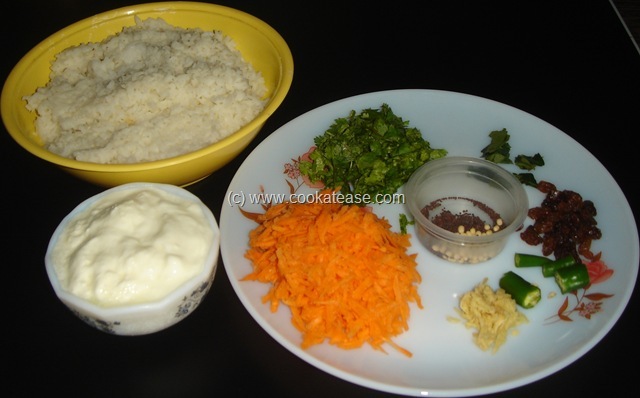 Red carrot and green coriander leaves give a nice colour to white curd rice. Children love this for its attractive colour. Cook one cup of rice with milk and water as explained above. Cool cooked rice, add salt, curd; mash and mix well with little water if needed; add chopped carrot and coriander. Heat oil, do the seasoning; add raisins, grated ginger and fry; add in the curd rice, mix well and serve chilled. adding milk while cooking rice gives a creamy texture to curd rice and keeps it fresh from getting soured quickly. if you have cooked rice already, mash and mix with boiled milk and curd. 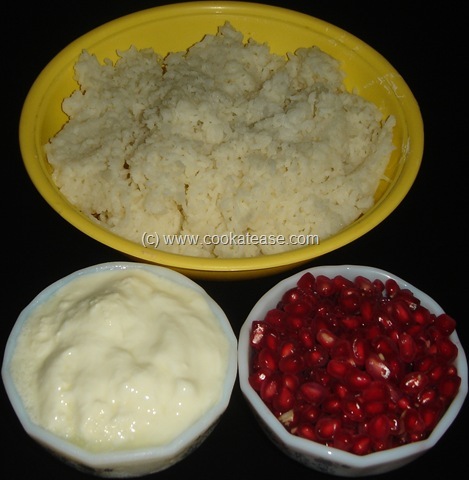 Curd rice with fruits: seasonal sweet fruits like seedless green/black grapes, mango, pineapple can be used as further variations. Curd rice with vegetables: seasonal vegetables like cucumber, raw mango with tomato and onion can also be used as further variations. Seasoning is required only for curd rice with vegetables. 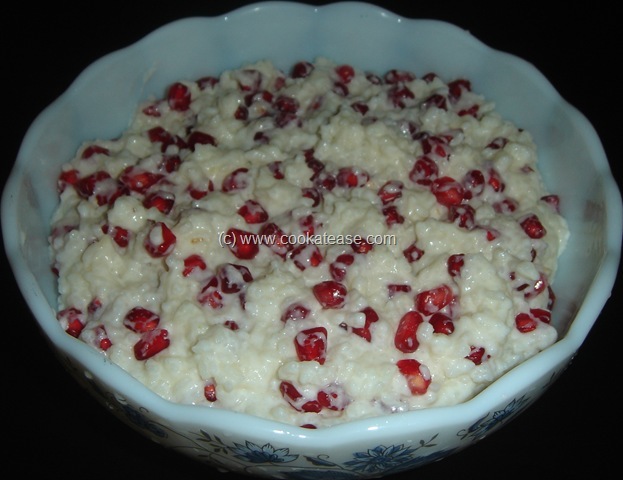 Never tried out curd rice with pomegranate seeds, seems fantastic idea…Just love any veggies in curd rice..yummy carrot curd rice..
hai this anu and i like card rice.some varity ware intyrodused in net thank you so much and bye. Hi… The dishes look yummy!!! We could even add few chopped black/green grapes and some peeled and grated cucumber in the curd rice. Next post: How to Prepare Vazhai Poo (Banana Blossom) for Cooking ?